Climb Day | The Exchange | Get Life. Give Life. 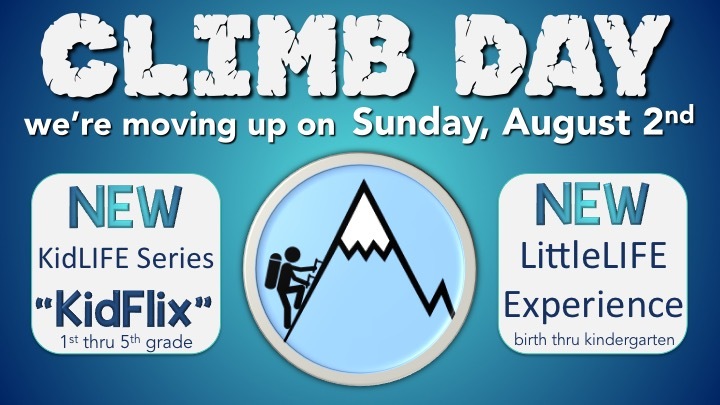 Sunday, August 2nd kids at The Exchange are “climbing” up! As a new school year begins, The Exchange kids are making a transition too. Children who are beginning 1st grade will move from LittleLIFE into our KidLIFE ministry for 1st-5th graders, and kids who are beginning 6th grade will move from KidLIFE to our StudentLIFE ministry on Wednesday nights for junior high and high school students. There will also be some exciting changes for our LittleLIFE ministry as a whole new experience launches for kids birth through kidergarten. Join us for an exciting new season beginning August 2nd!